Ever since the Georgia hoax news has been slow, but rest assured all of us at BfRLC are still on the forefront of Bf News as you can see by this post.Image Ent. will release Gorilla Pictures’ CG-animated family film The Legend of Sasquatch on DVD on Oct. 21. Featuring the voices of Oscar Winner William Hurt (The Incredible Hulk), John Rhys-Davies (The Lord of the Rings and Indiana Jones trilogies) and Jewel Restaneo (Easter Sunday), the movie tells the story of a family that moves to a secluded log cabin and discover a Bigfoot family hiding nearby. Marking the diretorial debut of visual effects supervisior Thomas Callicoat (Soft Target, Sci-Fighter), Legend of Sasquatch centers on a little girl who discovers that sasquatch aren't the scary monsters they’re made out to be, but rather friendly and gentle creatures. When a new dam threatens to flood thier cave home, the sasquatch turn to their human friends for help in preserving their ancient, secret way of life. Winner of the award for Best Feature Film–Animation at the 2007 International Family Film Festival, the movie was written by Callicoat and exec produced by Bill J. Gottlieb. William Hurt serves as co-producer. Associate producers are Jonathan Freeman, Kyle Lemire, John Rhys-Davies and Matthew Scott Weiner. Special DVD features will include audio commentary, behind-the-scenes featurettes, a Legend of Sasquatch quiz and special collector’s packaging featuring faux sasquatch fur. The disc will carry a suggested retail price of $27.98. Bigfoot hunters are still reeling from the latest hoax, but some scientists keep the faith. An apostle of what he calls "the behind the scenes, quiet march of serious science," Meldrum has been investigating the possible existence of the creature called Sasquatch or Bigfoot for the last 12 years. When Meldrum heard that Las Vegas promoter and self-described Bigfoot hunter Tom Biscardi was involved, and his excitement evaporated. Meldrum had dealt with what he calls Biscardi's "shenanigans" before. An irate Biscardi called Whitton and Dyer, who admitted to the hoax, then skipped town, allegedly leaving Biscardi with the bill for their Palo Alto hotel room. Bigfoot researchers may be embarrassed by it, but not all publicity is bad publicity. The latest hoax lit up the Bigfoot chat boards brighter than the opening ceremonies at the Beijing Olympics. Until then the search for Bigfoot will remain part sensationalist commercialism and part legitimate scientific research. These are hard times for Bigfoot believers, a human subspecies that includes a fairly hairy collection of fantasists, charlatans, grifters and fools. But there is also a small coterie of serious scientists interested in the possibility—as they see it, the likelihood—that somewhere in the deep woods of North America enormous ape-men really are alive and well and just barely eluding detection. Jeff Meldrum, a Ph.D. anthropologist at Idaho State University, is one of those researchers. An apostle of what he calls "the behind the scenes, quiet march of serious science," Meldrum has been investigating the possible existence of the creature called Sasquatch or Bigfoot for the last 12 years. His 2006 book, "Sasquatch: Legend Meets Science" (Forge), offers the most thorough compilation and analysis of evidence to date, and was endorsed by primatologist Jane Goodall, famous for her work with chimpanzees, who is an adamant Bigfoot believer herself. Yet such is the call of all the wild stories about this mythic creature that even Meldrum let himself hope against hope when he started to hear reports in July that two men had dragged the body of a Bigfoot-like beast out of the north Georgia woods and frozen it solid in a 1,500-pound block of ice. The news sounded like the breakthrough that the Bigfoot community has been waiting for: a body, specifically DNA evidence; the proof they need to satisfy a skeptical world. Then Meldrum heard that Las Vegas promoter and self-described Bigfoot hunter Tom Biscardi was involved, and his excitement evaporated. Meldrum had dealt with what he calls Biscardi's "shenanigans" before. In 2005 Biscardi brought him what he claimed was "a hand of unknown origin" that turned out to be nothing more than a bear paw in a pickle jar. That same year, Biscardi claimed to have a live, captured Bigfoot in Nevada and convinced listeners of a late-night radio show to pay $14.99 for access to his "webcam" to view the beast. Later Biscardi said he was the one who'd been duped—by an elderly woman whose claims that Bigfoot was in her backyard he'd never even checked out. Whether Biscardi really believed that the Georgians' frozen Sasquatch was the real deal or not--and he insists that he did—he certainly knew how to turn the story into a hot topic for the 24/7 news cycle in a country that's more than a little weary of politics, war and economic woes. You'd have thought one look at the YouTube clips posted by the two Georgia men who claimed the discovery would be enough to tip off even the blindest of the faithful that this was bogus. In one, Matt Whitton, a sheriff's deputy then on sick leave for getting shot in the hand (and now reportedly fired for perpetrating the hoax) has his brother pose as an absurdly implausible "very busy scientist." In others, Whitton and his partner, Rick Dyer, a former corrections officer, simply drive around to the theme of "Knight Rider," proclaiming themselves the "best Bigfoot trackers in the world." Yet because Biscardi had the audacity to promise DNA evidence, photos, and even video of Bigfoot creatures lurking in the woods, some 50 media outlets flocked to the Crowne Plaza hotel in Palo Alto, Calif., on Aug. 15 for the press conference that Biscardi had set up: ABC, CBS, The Associated Press … NEWSWEEK. By the end of the day, this latest installment in the Bigfoot saga was the most-viewed story on MSNBC and CNN.com, which carried live coverage of the 45-minute conference that Friday afternoon. But, then, despite the excitement, the proof proved nonexistent. The pictures were laughable. There was no video. And the DNA evidence? It came back possum. "It means he'd probably eaten one," insisted Biscardi, who at the time had taken the Georgians under his wing but now says he plans to sue them for fraud. Their lawyer says they were the ones who were duped as Biscardi spun their little joke into a national news event. Biscardi says he and his backers shelled out $50,000 for the body, only to discover days later that—shock!—it was nothing but a costume stuffed with animal parts: ham bones, intestines, eyes, teeth, an entire pig and, it would seem, some possum. "We're still pulling things out of it," says Bob Schmalzbach, one of Biscardi's associates who went to Georgia the day before the press conference to deliver $50,000 in cash to Whitton and Dyer. He said he thought what he saw in the block of ice was the real deal. "I could see a silhouette. I chipped the ice down to teeth and eyeballs, and thought, "This is a real animal here." So Schmalzbach handed over the money and hauled away the enormous Sasquatch-sicle in a trailer while toasting his fellow Bigfoot hunters. "We were sure we'd solved the mystery." By Sunday morning the jig was up. The body had thawed enough for Schmalzbach to see it was a rubber costume. An irate Biscardi called Whitton and Dyer, who admitted to the hoax, then skipped town, allegedly leaving Biscardi with the bill for their Palo Alto hotel room. Bigfoot investigators who hope to be taken seriously claim the hoax is a blight on the reputation of an industry, if not a science. "This kind of stuff discredits what we're trying to do and has ticked off a lot of people," says Matt Moneymaker, head of the Bigfoot Field Researchers Organization, a group based in Orange County, Calif., that has catalogued thousands of reported sightings since it launched in 1995. For the last four years, BFRO has organized almost weekly expeditions across the country. Members make audio recordings of supposed Bigfoot calls, study footprints, ride around on all-terrain vehicles, use night-vision goggles--and charge spectators for the chance to tag along. Moneymaker says what his group does is legit research compared to the P. T. Barnum approach of a Biscardi. But the great 19th-century huckster and hoaxer who famously said "there's a sucker born every minute" also said, more usefully, and perhaps more truthfully, "without promotion something terrible happens … Nothing!" Bigfoot researchers may be embarrassed by it, but not all publicity is bad publicity. The latest hoax lit up the Bigfoot chat boards brighter than the opening ceremonies at the Beijing Olympics. "It very much sets us back, but it also teaches us a lesson and shows us we need to think ahead," says Loren Coleman, a zoologist and consultant to such TV shows as NBC's "Unsolved Mysteries" and the Discovery Channel's "In the Unknown." But Coleman's Sasquatch-centric Web site, Cryptomundo.com, crashed when it got 5 million hits the hour after he posted a picture of the Georgia creature slumped in a freezer. The next day traffic was up to 13 million hits every 10 minutes, proof that Bigfoot curiosity will not die even if the creature never lived. "It's aggravating that a person like [Biscardi] garners the press because of sensationalism," says Jeff Meldrum, an Idaho anthropologist who is an expert in foot morphology and locomotion in monkeys, apes and hominids. "There are certainly activities that are laughable," says Meldrum. "But there are also those that are attempting to legitimize a very serious inquiry into the possible existence of a relic population of great ape. This is my odyssey, this is my quest." Over the last dozen years, Meldrum has collected and studied more than 200 plaster casts of footprints, some as big as 16 inches, made from across the United States and Canada. On them he notes details such as ridge lines and tendon indentations that he says would be impossible for fraudsters to fabricate. Last October, Meldrum presented some of his evidence to a symposium of 40 paleontologists at the New Mexico Museum of Natural History, and emerged with a peer-reviewed published paper acknowledging that what he'd collected were not the prints of a known species, nor were they hoaxes, but genuine casts of an unknown North American primate. Meldrum was given the authority to classify the beast with a taxonomical name, the Anthropoides Ameriborealis, which translates into North American ape. It might not seem like much compared with a body in a freezer, but in the uphill battle of Bigfoot science, it's a huge step, and as close to acknowledged scientific proof as anything seen to to date. "It has certainly helped me shift the perception from that of tabloid fodder into the arena of biology," says Meldrum. "But a new species will only be recognized when DNA is collected." And Meldrum, much like the creature he believes is out there, will continue his work largely unseen and unheard. 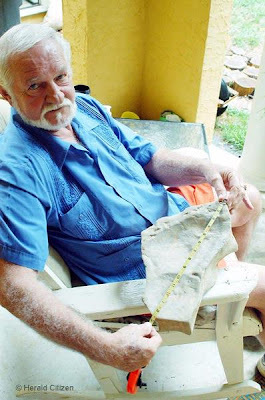 Harold Jackson of Cookeville measures a mysterious footprint he found near the Caney Fork River. "(My friend said) 'That looks like a footprint.' I had seen it before, but I didn't think anything about it," said Jackson. "But then when my friend said that, I got to looking at it, and sure enough, (I thought), 'It's got to be a footprint.'" Jackson pried the fossilized print up from the surrounding rock and brought it home. As he rinsed off the mud, he was impressed at the detail in the impression. Not only was the outline of the foot clear, but also the impression of the toes, the heal and the ball of the foot. Looking at it from the side, he could see where the weight of the walker had pressed the now hardened mud tightly together directly under the print, whereas the fossilized mud down deeper was not as closely packed. After studying it closely, Jackson is still unsure of what the footprint is from, but whatever it was, it was big. "This is 11 inches across and 15 inches (long). And my foot's about four and a half by about 10," he said. One of his theories is that the print might have come from a Native American. In the area where he found the print, he has found many artifacts such as arrow heads, ancient tools and even cave paintings. "But if this was an Indian, he was a very big Indian," said Jackson. Another theory is that it is from some kind of animal, though Jackson has no ideas as to what kind of animal it might be. The print itself appears human except for something that looks like a claw mark near the heal. Jackson suggests it might be something like a dewclaw, an undeveloped claw or digit commonly found on mammals such as dogs, cattle and deer. However, the print is clearly not from any of these animals. "This kind-of makes me believe in Bigfoot," said Jackson. In a recent trip back to the site where the print came from, Jackson came across what he believes may be the print of the right foot. This one is fossilized in a much larger rock - one Jackson is unable to pull out. So for now it remains where he found it. Jackson plans to keep the footprint that he was able to pull up, however he is willing to let scientists study it. "I'm not wanting any credit or anything for it. I just found it and thought it might be interesting to the people to see this," he said. "I've never seen anything like it." In our ever diligent self-appointed duty to find only the best Bigfoot info worth Reading we have found quite a gem! WWW.Bigfootencounters.Com is probably one of the best sites for a newbie Bf researcher to stumble upon. For one I like how it focuses on sightings located to single state of California. Although there are a few databases that cover North America and beyond, I feel like sighting reports can be personal and are equally about the local color and communities surrounding them. Bigfootencounters.com obviously believes the same and allows visitors to share their own storiesof past encounters. The site is extremely well-planned and organized. After the California sitings database. It starts with The Classics A collection of the most famous sightings any Bf researcher worth their binoculars would know. Followed by Bigfoot creatures: the many different versions of half-men half-beast around the world. Then on to some research and science with links to anthropology and biology. Bigfootencounters.com descibes themselves best on their first page. This website came together through the years with the help of many wonderful people including scientists, friends, forestry, fish & game, loggers, USGS workers, Native Americans, First Nation Canadians, the Chinese, Mongolians, Russians, Tibetans, Indonesian scholars; trackers, guides, coolies, porters, translators and skilled laymen. It is primarily put together for the benefit of placing easy access information out there for those who have an interest. This website is not here to persuade, only to place information for the perusal of the interested. I've added it to the top of my list of recommended BigFoot Web resources. Browsing through it is like taking an accellerated college course: Introduction to Bigfoot. The 1040EZ of BF411 101. Seti has a podcast titled Skeptical Sunday. The weekly hour-long radio program features top scientists talking about the latest in genetics, paleontology, technology, physics, and evolutionary biology - as well as cosmology and astronomy. Find out how to extract DNA from a banana, what size wrench you need to build a time machine, and whether dark energy can be bottled (yes).